The Grateful Dead is closing the lid on its storied half-century of concerts this weekend in Chicago, where a museum has captured the band's prankster heart by displaying its artifacts, skeletons-and-roses iconography included, in the shadow of a world-famous dinosaur. Soldier Field, which was the last place legendary guitarist Jerry Garcia played with the band before his death in 1995, is hosting the final three shows of the short "Fare Thee Well" tour in what the remaining core members — rhythm guitarist Bob Weir, bassist Phil Lesh and percussionists Mickey Hart and Bill Kreutzmann — say will be the last. The lakefront stadium, just south of the Field Museum and the bones of Sue the Tyrannosaurus rex, will be a sea of tie-dyed shirts, and the sounds of bootleg concert tapes will fill the air in the parking lots. 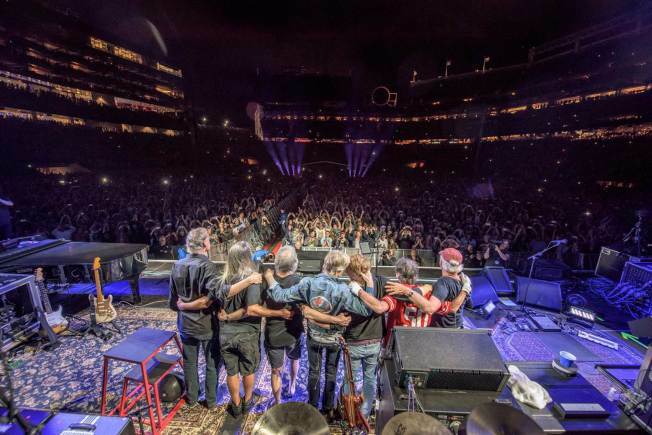 Certainly, there'll be young people who never saw Garcia play among the tens of thousands of fans, but they'll likely be outnumbered Deadheads who display more than a touch of grey. That so many older fans are coming in may help explain why the city heard few complaints after it nixed the idea of overnight camping sites near Soldier Field. Deadheads are shelling out for one more Saturday night — from $100 Dead-themed dinosaur posters at the Field Museum created and signed by longtime Dead artist Stanley Mouse to pricey hotels. Hotel bookings are up more than 120 percent from last year's July Fourth weekend, and the rates are 77 percent higher on average, according to travel booking website Orbitz. No matter the price, fans say it's worth the chance to reconnect with both an important band and the family-like community. This weekend, though, he expects all those old feelings a Dead concert used to elicit to return: "People are going to be walking past, thinking, 'Look at those old hippies. I'll be grateful when they're dead.'"